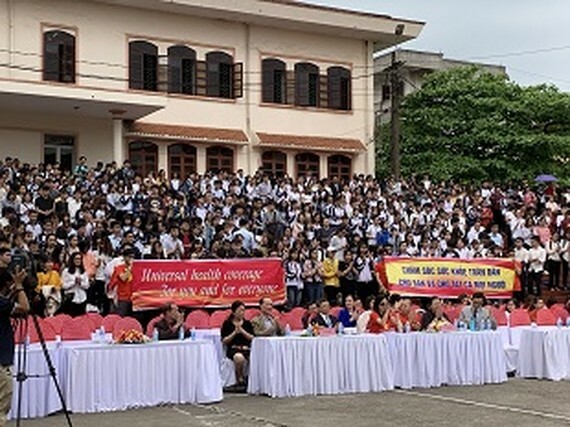 Thai Nguyen University of Medicine and Pharmacy in the northern province of Thai Nguyen yesterday collaborated with the Partnership for Health Advancement in Vietnam, the World Health Organization (WHO), and Harvard Medical School Center for Primary Care (HMSCPC) to celebrate the World Health Day 2019. Over the past decade, Vietnam has made significant progress toward achieving universal health coverage (UHC) for its population and increased political and monetary commitments to advance UHC. Achieving UHC is one of the key targets for the Government of Vietnam and of the 2030 Agenda for Sustainable Development Goals (SDGs), and creating strong Primary Health Care is a foundational component for both. 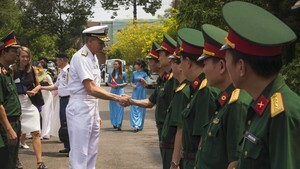 “Vietnam will require continued strong government leadership and commitment, as well as multi-sectoral actions to address the changing health needs. With more investment in primary health care, both financially and in the health workforce, we can make UHC a reality in Viet Nam.” said Dr. Kidong Park, WHO Representative in Vietnam. “A primary health care approach is the most efficient and cost-effective way to maintain a health system and to make care accessible to all individuals and families in a community and all around the world. Decades of experience of HAIVN working to improve the Vietnamese health system tells us that primary health care produces better outcomes, at lower costs, and with higher user satisfaction. It is so important that we train the next generation of health professionals to have an understanding and orientation toward primary care” said Dr. David Duong, Deputy Director of the Program in Global Primary Care and Social Change, Harvard Medical School Center for Primary Care. This event provides health professional students with a better understanding of what UHC means – what services and support should be available and where, and the need for youth excitement, enthusiasm and advocacy for UHC. Specifically, the event will focus on achieving UHC through primary healthcare. Primary health care is well-positioned to respond to rapid economic, technological, and demographic changes, all of which impact health and well-being. Stronger primary health care is essential to achieving the health-related SDGs and UHC. It will contribute to the attainment of other goals beyond the health goal (SDG3), including those on poverty, hunger, education, gender equality, clean water and sanitation, work and economic growth, reducing inequality and climate action. “TN UMP is aware of our fundamental role in nursing the health workforce to achieve the primary health care and UHC requirement, and to respond to the growing demand for health workers: it is projected that an estimated 40 million health sector jobs will be added to the global economy by 2030” said Dr. Nguyen Van Son, President of TN UMP. World Health Day in 2019 falls midway between the Global Conference on Primary Health Care held in Astana, Kazakhstan in October 2018 and the High-level Meeting on universal health coverage to be held at the United Nations General Assembly in September 2019. The Day will serve as an opportunity to communicate about the importance of equity in health-care services, not only for the health of individuals, but also for the health of economies and society at large.